Retiring after nearly 40 years’ association with The Standard Motor Co. Ltd., Mr. W. D. Bradley, Trade Sales Executive at the Company’s London Showroom, recently received a silver cigarette box from the Board of Directors in appreciation of his long service. Here seen making the presentation to Mr Bradley (third from left)—is Mr M. Whitfield, General Sales Director. 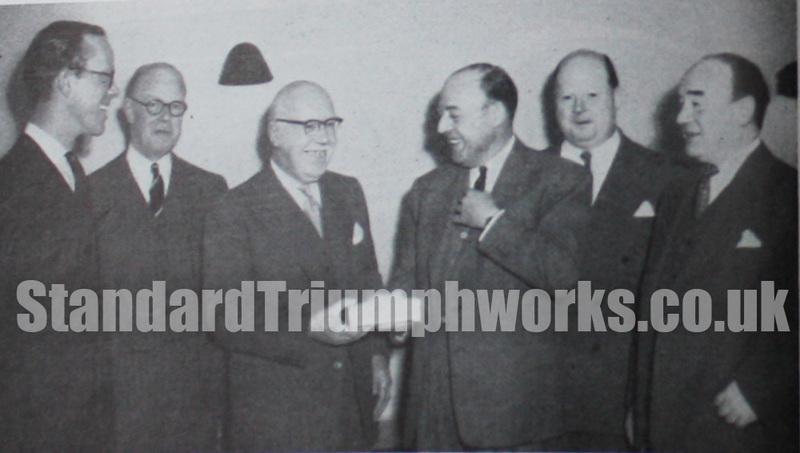 Also in the picture are—left to right—Mr D. R. Maude, London Sales Executive ; Col. R. E. Maude, formerly Managing Director, Standard and Triumph Sales Ltd. ; Mr F. E. Higham, Director of Home Sales; and Mr. P. W. Bingham, London Manager. Mr Bradley was first employed by the Company at the old Pall Mall showrooms in 1919, and since that time he has been associated with Standard both as an employee and a distributor. Even now he has not severed his connections, for since his retirement he has taken over an appointment with Ridge Motors, Standard and Triumph dealers at Southgate in North London.